Pocket aces is the best hand that you can possibly be dealt in Texas Hold'em. And while many like to complain about all the times they lose with it, the bottom line is that AA will far and away be your most profitable hand in poker over the long run. So more than any other starting hand in this game, it is a good idea to have a solid strategy for how to play it. It is also a good idea to have a clear strategy for when to fold it (yes you should be doing this on occasion). This is a very simplistic explanation though. So in this article I am going to break it down for you step by step how to play pocket aces in the most profitable way, just like the pros do. Your default strategy in any poker game should be to raise or re-raise when you get dealt aces. If you are new to a table and you don't know anybody, then you should employ this strategy 100% of the time. Why not slow play your pocket rockets you might ask? Because AA is the best starting hand in the game and the only way that you are going to win a big pot with it is by building the pot yourself. This is especially the case at the lower stakes. Many people fail to remember that most players at the lower limits are extremely passive. This means that they won't do the raising or the betting for you unless they happen to have a monster themselves, which is unlikely. Therefore, the only way to actually win a big pot against them is by putting lots of chips in the middle yourself. If they don't have anything, well there is nothing that you can do, they would have folded anyways. But if they have any kind of hand that they like (or piece of the board), then they are likely to call. When you have pocket aces, this is exactly what you want them to do. Now with all of that said, yes there is a time and a place for slow playing aces. This depends mostly on the history that you have with a specific opponent. If you play against a particular person often, then it is a good idea to mix things up from time to time in order to keep them guessing. Another instance where it would be a good idea to slow play your aces from time to time is versus somebody who has already raised preflop but folds an abnormally high amount of the time to a 3Bet (e.g. 80%+). Your HUD stats will provide you with this information. The bottom line though is that you want to be raising or re-raising with pocket aces the vast majority of the time that you play them. This will almost always be the most profitable way to play them especially at the lower stakes. What Should You Do With Aces After the Flop? My approach after the flop with pocket aces is very similar to my preflop strategy. That is, the large majority of the time I will be making the obvious straightforward play of just betting them. And yes, I will even be betting the a large amount of the time when I happen to flop top set. Because as I alluded to before, the two common traits that you typically find among low stakes poker players is passive play and a willingness to call. In other words, if they have anything that they like (bottom pair, middle pair, top pair, any draw etc. ), then they are going to call you. However, they typically will not make the bet for you if you choose to slow play. This is why I will just be making a default bet on nearly any board with aces. Now of course versus opponents who I have a deep history with, I will once again choose to mix it up from time to time. I will perhaps choose to check raise or check call once in awhile instead in order to keep them guessing about the way in which I play my hands. But against a random opponent or somebody with whom I have very little history, I will just make a bet on the flop nearly 100% of the time. What if You Get Raised With Aces? Now of course we aren't always going to take down the pot uncontested after we make our bet on the flop. Sometimes they are going to call us or even raise us. What to do in this situation depends a lot on the player type that you are dealing with. However, in general when I am called, I am just going to continue betting on later streets when I have pocket aces. If I am raised then things get a little bit more interesting. First off, I want to know about the tendencies of my opponent. In particular I want to know if this player raises a lot after the flop and how aggressive they are in general. A Flop CBet Raise of 15-20% is pretty typical for most tight aggressive regs. If they are significantly above this then I will be likely to at least call. If they are significantly below this though, then I will be extremely cautious and might even consider folding. The Total Aggression Factor stat in Pokertracker is a mathematical formula which gives us an overall indicator of postflop aggression or passivity of a particular player. The least aggressive value is 1. This stat is useful when you have a small sample size on your opponent. A value of 2 or 3 is fairly typical for most regulars at the micros. So if they are 1 or 4+ then once again you can adjust your reaction to their raise accordingly. If you are playing live poker, then obviously you do not have access to this kind of information. So in order to know how to proceed versus a raise when you have the pocket rockets this will depend on your overall read on your opponent. Online or live though, the board texture also plays a key role in my decision. With the first board there are just so many draws, pairs and pair+draw combo hands that they can have. However, on the second board they are representing almost nothing with a raise. Most people would slow play trip kings here and the only other value hand is the unlikely 22. So if I got raised on the first board versus an aggressive opponent I might actually consider re-raising for value (or at the very least calling) and then playing more aggressively later depending on the turn and river cards. Versus a tight passive player I will be very cautious though and might even consider folding. This is because this board hits their set-mining range very hard and I don't expect them to be raising me with their draws anywhere near as often. On the second board though I will almost always be just calling regardless of the player type. Re-raising in this situation puts you in a spot where you are likely to only get action from better hands and fold out all worse. I would rather keep their bluffing range wide and under-rep my hand here since I am almost certainly ahead. 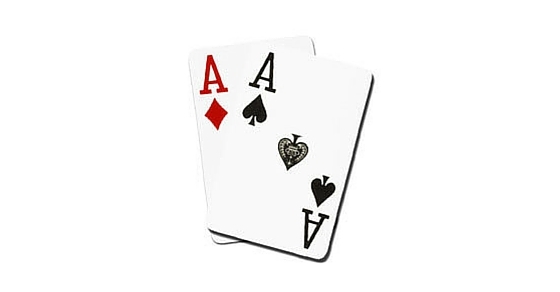 Playing your pocket aces well is extremely important in Texas Hold'em poker. This is because the good old pocket rockets will be your most profitable hand over the long run. Therefore, the amount that you are able to win each time you play them will go a long way towards determining your overall winrate. Most of the time, the straightforward way of raising and betting is going to be the most profitable way to play your aces. However, from time to time you might want to consider slow playing for deception against the regulars who you encounter a lot. And on occasion as well you might even need to make a difficult fold versus a tight passive player especially when they start giving you big action on boards that are likely to hit their set-mining range. Let me know your thoughts below on how you play your pocket aces. New Here? Check out my "Start Here" Page for all of my best poker strategy articles. Also, be sure to hop on my free newsletter below for tons more helpful tips!